(Nanowerk Spotlight) Molecular magnets or single molecule-based magnets are usually anti-ferromagnetic (non-magnetic) at room temperature, which so far has limited their use to laboratory environments. As the first successful molecular magnet in a real-world application, an interdisciplinary research group in Yokohama City University (YCU), Graduate School of Medicine and their collaborators (under the leadership of Drs. Eguchi and Ishikawa), including physicists, chemists, and clinicians, has reported a new 'exotic' molecular magnet compound – iron salen nanoparticles – which shows intrinsic magnetic nature at room temperature as well as anticancer properties. The research team has demonstrated that the 'unconventional' drug compound possesses a unique molecular structure with multifunctional features such as localized magnetic drug delivery, MRI imaging, and magneto-hyperthermia, for targeting various cancers such as for instance oral tumors and glioblastoma (see references below). However, the compounds have some shortcomings: they lose magnetism in organic solvents and are difficult to dissolve in an aqueous solution; similar to other existing chemotherapeutic drugs like Taxol, MTX, and DOX. This can result in severe side effects due to potential cytotoxicity when accumulated in healthy tissues and organs, and thus limits their clinical practices. Very recently, Dr. Jeong-Hwan Kim of the research team has overcome this problem by employing a one-step self-assembly technique using smart conducting copolymers, which allowed him to formulate an efficient delivery platform with high drug-loading efficiency of the water-insoluble anticancer drug (iron salen). The smart copolymer that he used in the study is consisted with two types of polymers – polypyrroles (PPy) and polycaprolactones (PCL) – as pH- and temperature- responsive components, respectively, and these copolymers are highly biodegradable. As a result, by a hydrophobic-hydrophobic interaction between the drugs and PCLs of the polymers, the drugs in a solvent can be loaded inside the PCL matrix encapsulated by PPy shells, forming a core-shell structure. Subsequently, this structure can be readily coated by natural bioadhesive agents such as albumin or gum arabic. Compared with standalone iron salen, not only were their solubility, biocompatibility and stability improved, but they show enhanced magnetism via a magnetic coupling between the core and shell system, resulting in boosted magnetic drug delivery, higher contrast in MRI, amplified hyperthermal effect, and controlled release at an acidic pH condition (pH <7) (a major feature of tumor tissue). This work has been filed in a JP patent (2016-103,660) and published in NPG Asia Materials ("Magnetic metal-complex-conducting copolymer core–shell nanoassemblies for a single-drug anticancer platform") on March 31, 2017, and highlighted in the 'Latest Research Summaries'. "In the history of drug delivery, nanoparticle systems have been always involved with micelles or liposomes in addition to common magnetic particles," says Dr. Kim. "However, these previous systems require complex synthetic steps and often unstable (leaky) under heating or physiological environments, e.g. pH, causing potential side effects." "On the other hand," he continues, "our as-prepared nanoparticles are the first synthetic demonstration on ‘metal salt-free’ method, rather than the traditional iron oxide nanoparticles-based methods, allowing high drug loading and colloidal stability over the magnetic heating and pH, as a single-drug-based platform. Unless there are two stimuli, it is extremely stable and even might be so in vivo. Hence, this technique is expected to be a novel therapy that can reduce side effects and maximize the local therapeutic effect." Eguchi, Haruki; Umemura, Masanari; Kurotani, Reiko; Fukumura, Hidenobu; Sato, Itaru; Kim, Jeong-Hwan; Hoshino, Yujiro; Lee, Jin; Amemiya, Naoyuki; Sato, Motohiko; Hirata, Kunio; Singh, David J.; Masuda, Takatsugu; Yamamoto, Masahiro; Urano, Tsutomu; Yoshida, Keiichiro; Tanigaki, Katsumi; Yamamoto, Masaki; Sato, Mamoru; Inoue, Seiichi; Aoki, Ichio; Ishikawa, Yoshihiro (2015). 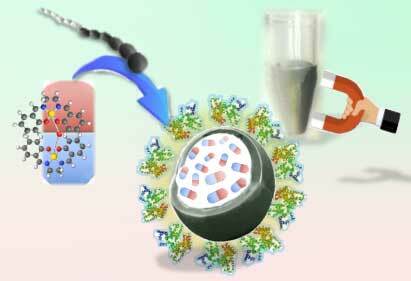 "A magnetic anti-cancer compound for magnet-guided delivery and magnetic resonance imaging". Scientific Reports. 5: 9194. Sato, Itaru; Umemura, Masanari; Mitsudo, Kenji; Fukumura, Hidenobu; Kim, Jeong-Hwan; Hoshino, Yujiro; Nakashima, Hideyuki; Kioi, Mitomu; Nakakaji, Rina; Sato, Motohiko; Fujita, Takayuki; Yokoyama, Utako; Okumura, Satoshi; Oshiro, Hisashi; Eguchi, Haruki; Tohnai, Iwai; Ishikawa, Yoshihiro (2016). "Simultaneous hyperthermia-chemotherapy with controlled drug delivery using single-drug nanoparticles". Scientific Reports. 6: 24629. Ohtake, Makoto; Umemura, Masanari; Sato, Itaru; Akimoto, Taisuke; Oda, Kayoko; Nagasako, Akane; Kim, Jeong-Hwan; Fujita, Takayuki; Yokoyama, Utako; Nakayama, Tomohiro; Hoshino, Yujiro; Ishiba, Mai; Tokura, Susumu; Hara, Masakazu; Muramoto, Tomoya; Yamada, Sotoshi; Masuda, Takatsugu; Aoki, Ichio; Takemura, Yasushi; Murata, Hidetoshi; Eguchi, Haruki; Kawahara, Nobutaka; Ishikawa, Yoshihiro (2017). "Hyperthermia and chemotherapy using Fe(Salen) nanoparticles might impact glioblastoma treatment". Scientific Reports. 7: 42783.